Yes, you read that right. A company who produces polished videos is telling you “there is still a place for the rough and raw” video. Not every scenario and video needs a multi-cam setup, enough LED lights to illuminate a football field and the highest caliber of audio equipment. Shooting on the go can work just as well as the fully produced video. We found ourselves in this situation last week during the High Five marketing conference. I was giving a talk about video during the conference and the idea to shoot a quick video promoting my talk hit me the morning of. Instead of breaking out the big cameras, setting up the lights, rigging up the microphone and throwing the footage into an editing program, our video guy suggested we just use an iPhone. 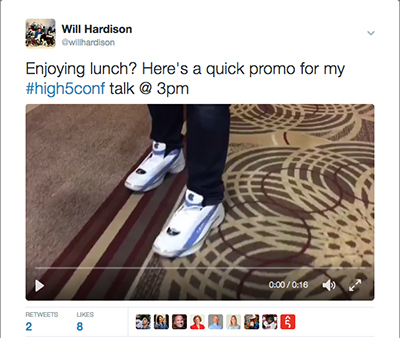 It took us a few takes, but within 10 minutes we had a great 20 second video that we pushed out over social media using the conference’s hashtag to promote my talk. Of course, just like any other video, even at the rough and raw level lighting and sound are the two most important aspects of a video. Here are a few tips and tricks for shooting a great looking rough and raw video. While you don’t need crazy lighting, it is important that your subject is well lit so that it doesn’t look like you shot in the closet. If you are shooting in a large room, try to shoot under a ceiling light (but be careful of harsh shadows) to ensure a well-lit shot. Another tip, if you are filming with a phone, you can either turn on the light from the phone you are using, or for better results, use a secondary phone as the light source. This will allow you to position the phone just right to provide nice light. I will warn you, the direct light from the phone will be a bit harsh. It’s better to use a secondary light source. Although the light from your phone or secondary will work, you can hack together a decent little light kit from your local hardware store for under $100. Even an LED desk lamp can solve your lighting problems. Picking up sound, especially using a phone to film, can be a challenge. The easiest and quickest solution is to film your subject as close to the phone as possible. The further away the subject, the more the echo. A solution for well under $100 – snag a Rode Me Directional mic for smartphones. 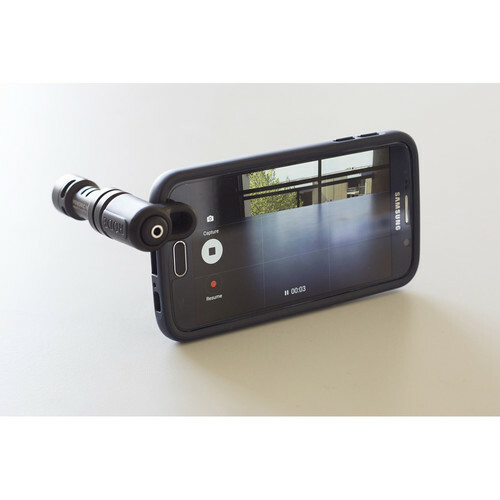 We actually don’t have one of these, but everything else we have from Rode works great, so I can only imagine this little mic will help boost your smartphone audio capturing. BONUS TIP! Use the Exposure Lock on your phone. This is a great little unknown feature that works great for shooting video and photos on your phone. You probably have noticed when taking a photo or video on your phone that it continually tries to focus and adjust the exposure level to what’s in the frame. If you’re shooting a video, this can quickly become a headache and create various exposure levels while shooting. To solve this problem, you’ll need to lock your exposure and focus. It’s simple to do and this video below that I found on YouTube does a nice job of explaining how to do it. I hope these tips help encourage you to pull out your phone and start shooting video! We are always happy to help answer any questions – if you have a video question, send us an email [email protected] and we’ll do our best to help!